The station is located between Greenwich and Elverson Road stations, and is on the boundary of Travelcard Zone 2 and 3. 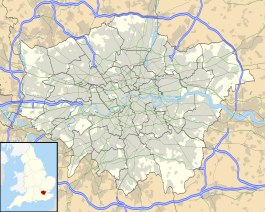 It is sited in the Royal Borough of Greenwich and is very close to the boundary with the London Borough of Lewisham. The station layout consists of two elevated side platforms which run roughly north-south over the A2 road and parallel to the River Ravensbourne. The station was opened in 1999 as part of the southern extension from Island Gardens to Lewisham. The station was largely reconstructed and considerably enhanced when it was extended to enable 3-car trains to call at it. London Buses routes 47, 53, 177 and 453 and night route N89 serve the station. ^ "Administrative Areas". MAGIC - Multi Agency Geographic Information for the Countryside. Natural England. Retrieved 25 January 2009. Wikimedia Commons has media related to Deptford Bridge DLR station. This page was last edited on 8 February 2019, at 15:01 (UTC).